This was such an easy and delicious pasta dish. 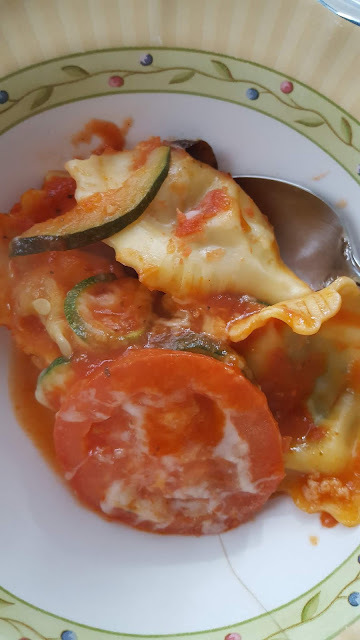 You can really make it your own - use whichever flavor of ravioli you like! We used half Italian sausage, and half spinach & ricotta cheese. This is easily thrown together for a busy weeknight dinner. I wasn't planning on sharing this one on the blog, so I didn't really take pictures of it - but then after tasting it I realized I wanted to share it after all so bad photo and all here it is - a quick and easy veggie loaded pasta dish tucked in with a gooey layer of mozzarella cheese. It takes the flavors of lasagna and really simplifies the process. Preheat oven to 350 degrees, spray a 9x13 baking pan with non-stick cooking spray. Saute mushrooms in a large nonstick skillet, heated over medium to medium-high heat with about 1/2 - 1 TBS of olive oil (or bacon grease). Cook about 5 minutes, until they release their moisture and are browned. Remove from heat. Layer 1/3 of the spaghetti sauce in the bottom of the pan, top with half of the ravioli. Spread in layers: mushrooms, zucchini, tomatoes, half of remaining sauce, parmesan cheese, and about 1 cup of mozzarella. Add remaining ravioli, topped by remaining sauce and cheese. Cover with foil and bake 40 minutes until heated through and cheese is melted. If you want to brown your cheese, remove the foil and return to the oven for another 5-10 minutes if desired.